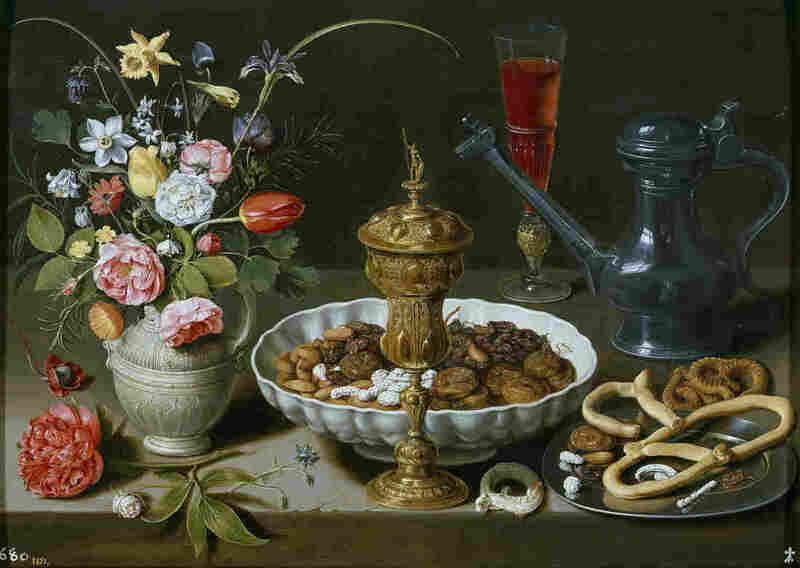 In A First, Spain's Prado Museum Puts The Spotlight On A Female Artist : Parallels Clara Peeters, a 17th century Flemish painter, hid tiny self-portraits in her still life paintings. She wasn't a household name, then or now, and just 40 or so of her paintings have survived. 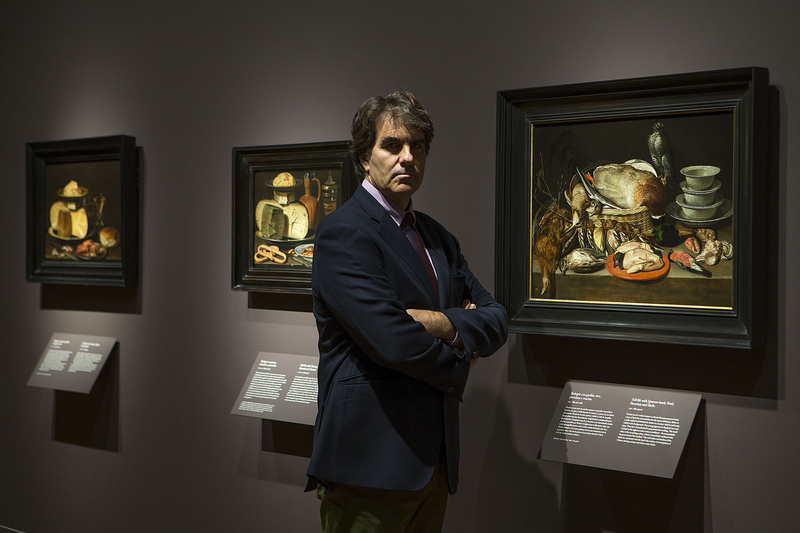 Alejandro Vergara, curator of northern European paintings at the Prado Museum in Madrid, stands in front of several works by 17th century Flemish artist Clara Peeters. She is the first woman to receive her own exhibition at the nearly 200-year-old museum. Spain's national art museum, the Prado, has been around nearly 200 years and has one of the world's biggest collections of Renaissance and Baroque art. But only now has it devoted a solo exhibition to a female artist: the 17th century Flemish painter Clara Peeters. Not much is known about Peeters' life. The mysteries include her family background, the dates of her birth and death, and even her age in 1607, when she painted her first known work — a dark, intricate still life of a candlestick next to sprig of rosemary and a glass of wine. Barely 40 of her paintings have survived the centuries. Fifteen now hang in the Prado as part of this exhibition, many on loan from other museums and collections. Most were painted in 1611 and 1612. A few of Peeters' paintings had been in the Prado for years, mixed in with other artists from the Baroque period in northern Europe. But until now, she never had a room of her own. When the Prado decided a few years ago to search for a female artist to showcase, the museum's director went to Alejandro Vergara, the senior curator of northern European paintings. Vergara says Peeters immediately came to mind. Still life with Fish, Candle, Artichokes, Crabs and Shrimp was created by Clara Peeters in 1611. But Vergara also tells a personal story from several years earlier, when his wife at the time came to visit him at work. "Visiting the museum one day, she asked, 'Where are the women artists?' And I couldn't find any," Vergara recalls. "So I went into our storage and we brought [Peeters'] paintings out." Peeters' works are mostly still life paintings of fruit, fowl, fish, bowls and goblets. But there's a twist: She painted her own reflection — tiny self-portraits — hidden in her compositions. "Several of her paintings have metal gold cups, and on those cups you see seven reflections with her face — seven self-portraits," Vergara explains. "That is a very unusual thing to do at the time. [It] seems to speak of someone who's discreet and modest, but really is seducing you into looking closely and carefully. And when you do that, you find her. So she's really trying to be seen." She was trying to be seen in the 17th century art world, run by all-male art guilds. Peeters may have come from a family of painters. But she wasn't a household name — then or now. "That was, I must admit, the first time I heard her name," says Flemish Culture Minister Sven Gatz, describing the call he received from Prado officials inviting him to this exhibition of a Flemish painter. He says he had to look up who Peeters was. 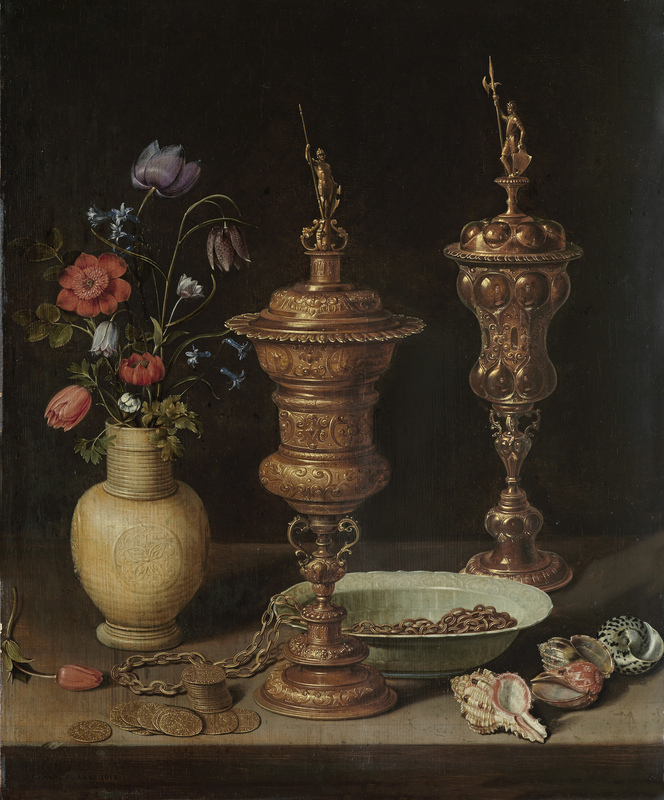 Still life with Flowers, Gilt Goblets, Coins and Shells was created by Clara Peeters in 1612. Peeters hid small self portraits in the goblet on the right. "But it was quite nice to see that the old masters were not always the 'old boys,'" Gatz says. "There were also women." In modern art, there's more gender parity. But when you browse through collections of medieval, Renaissance or Baroque art, it's mostly male artists. "I think there have been equal numbers of male and female artists. It's just that we have history being told exclusively through male eyes and voices," says Micol Hebron, a feminist artist, activist and associate professor at Chapman University in California. A few years ago, Hebron launched Gallery Tally, a survey of gender in hundreds of museums and galleries worldwide. She says she found that even in contemporary art, there's a roughly 70-30 split of male versus female artists on display. With older art, it's even harder to find women — but that doesn't mean they weren't there, she says. "There were many women artists who took on the names of male artists or who had anonymous attributions to their work — or who were doing the work in male artists' studios and were under-acknowleged," Hebron explains. "A lot of that information is no longer secret." Museums are now starting to act. Over the past decade, the National Gallery in London has held at least two solo female shows. The Louvre in Paris has spotlighted contemporary women's art. 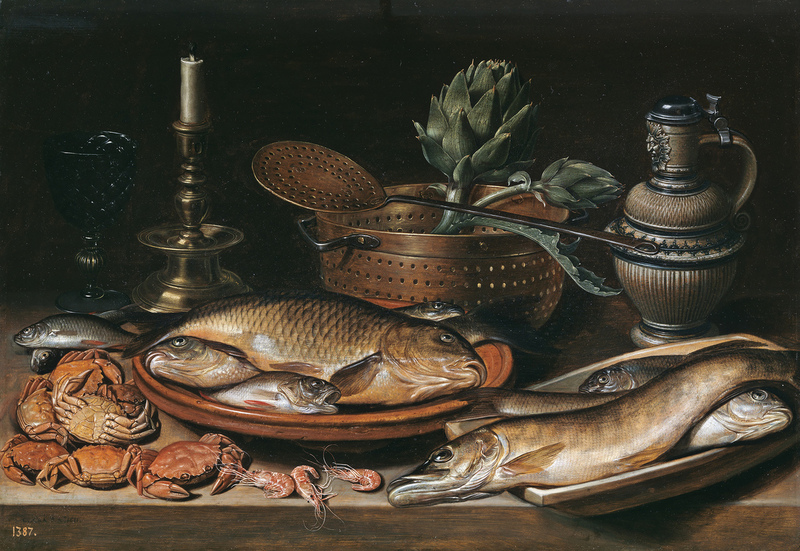 The Royal Museum of Fine Art in Antwerp, Belgium — Clara Peeters' hometown — recently hosted a solo exhibition of her work, including many of the paintings now on loan to the Prado. Still life with Flowers, Gilt Goblet, Almonds, Dried Fruits, Sweets, Biscuits, Wine and a Pewter Flagon was created by Clara Peeters in 1611. In conjunction with the Clara Peeters exhibition, which runs through Feb. 19, 2017, the Prado is hosting an academic conference on women in art, organized by Maria Cruz de Carlos, an art historian who specializes in religious images, women's culture and engravings. "The historical facts deny the idea that women didn't have a presence in the arts. They always did," Carlos says. "It's art history that has hidden that presence." She says stodgy old art museums, rooted in tradition, are slowly changing. The Prado's collection includes more than 5,000 male artists and 41 women — though it likely has more, with their works labeled as "anonymous," Carlos says. As women emerge from behind those works, they reveal their role in an art world mistakenly seen for centuries as all-male. Clara Peeters made that clear, with her self-portraits popping out of dark corners in her still life paintings — demanding to be seen.